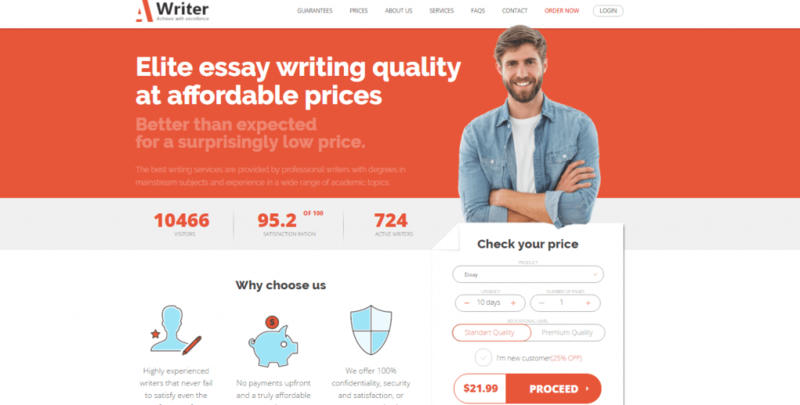 As the name suggests, MyEssayWriter.net writes essays for students of all academic levels. Still, you may be surprised to hear that this is the only paper this company offers. Their list of services is focused on various essay types and writing styles, which makes it an interesting choice if you are specifically looking for an essay. But, what else do they offer and are their essays as good as My Essay Writer promise? Offering writing, rewriting and editing services for essays only, our Services section in this Myessaywriter.net review is very short. The fact is, students often look for regular content provider. Seeing that they are assigned an array of academic papers, being limited to ordering only one type of paper is a big disadvantage. Still, if an essay is highly important for your academic success, perhaps the best option is a company that specializes in only this type of paper. Once we checked the quality and prices, we found out whether the company is worth your time or not. Read on. A single page of an essay for high school level and a deadline of a week costs $20, which is a steep price when compared to those of other services. Unfortunately, you cannot find a pricelist anywhere on the website, which means that you would have to enter all the information about your paper in order to see the quote. We looked for first order discounts, loyalty program or any special offers everywhere on the website. Still, this is absent from the website content, and we found no such information in online feedback, either. After seeing the quote, we were disappointed by the high pricing. These are very high prices for a student’s budget, especially since discounts are non-existent on the website. The quality of our essay was solid, but the price was very steep. We paid $60 for a high school level essay of only 800 words, which is an extremely high price for a deadline of a week. Still, we found the writing style to be very good and detected no plagiarism in our paper. The writer delivered the paper in time and followed all our instructions carefully. You can email My Essay Writer, call their agents on the toll-free phone number or use the live chat option. We preferred the live chat since the phone agent did not speak good English and the e-mail agents took days to reply to our messages. Generally, we are satisfied by the customer service. However, we found the live chat agent’s replies to be automatic and a bit vague. In conclusion, myessaywriter.net is a company that specializes in essay writing and delivers quality papers. The biggest disadvantage of this company and the reason why we cannot recommend it is the originally high pricing and the lack of any discounts. If you are not on a limited budget, this company may be a good place to order your essay from. But remember, essays are all you can find here, so look for other companies if you need help with other academic papers.